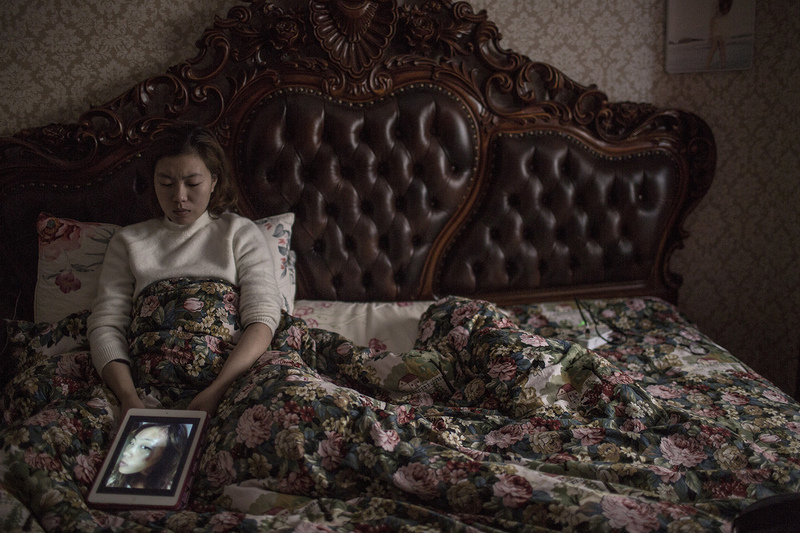 Huang Fang, photographed in her home in Hebei province in February 2016, shows a photo of the injuries she sustained in a beating by her husband. China Has a New Domestic Violence Law. So Why Are Victims Still Often Unsafe? Written police warnings and court protective orders are two of the most prominent features of China’s landmark DV Law, the culmination of two decades of advocacy by women’s rights organizations following Hillary Clinton’s famous speech in Beijing at the 1995 World Women’s Conference on stronger protection of women’s rights. Given the prevalence of domestic violence in China, which the All China Women’s Federation estimates afflicts about a third of all Chinese families, the new measures introduced by the DV Law have been hailed as important legal remedies for improving victim safety. The DV Law also sets the stage for local experiments in new implementation mechanisms to improve the government’s response to domestic violence. I have participated in several pilot projects in Hunan and have observed firsthand both the progress and challenges entailed. There are encouraging signs so far: China’s Supreme People’s Court recently announced that 680 protective orders had been issued by courts nationwide by the end of 2016. A number of provincial governments, including Hunan, also released implementing guidelines to encourage the use of written warnings in police responses to domestic violence. However, for many victims like Zhang, these protective measures do little to stop violence by their abusers. This is because under the DV Law, both measures are intended to deter only minor domestic violence offenses. Written police warnings carry neither civil nor criminal penalties against those who refuse to comply. Violations of court protective orders do not constitute a crime and are punishable only by reprimands, minor fines of less than 1,000 renminbi (about U.S.$145), or court-ordered detentions of 15 days or less. Moreover, courts, not the police, are the primary enforcers. The experience of one victim from Zhejiang province shows that protective orders are often worth little more than the paper they are written on: In that case, the victim was able to obtain two separate court protective orders against her husband for repeated beatings and harassment. Yet, when the violence continued despite the court orders, her only recourse was to return to court a third time to seek a fine of 500 renminbi (U.S.$73) against her defiant husband. One major reason for the lack of strong criminal justice response in support of these protective measures is the DV Law’s failure to treat domestic violence as a crime. Despite the DV Law’s express recognition of domestic violence as an “infliction of physical, psychological or other harms among family members through means such as beating, restraints, maiming, restriction to physical liberty, as well as verbal abuse or intimidation” (Article 2), domestic violence is deemed a civil offense unless the abuse is serious enough to violate China’s penal laws. In doing so, China follows an outdated legal approach once prevalent around the world which defers to the criminal law regime to handle more domestic violence offenses as common crimes. Recent domestic violence law reforms in many other countries have led to either outright criminalization of domestic violence in conjunction with the adoption of mandatory arrest polices, or at a minimum, criminalization of violations of protective orders which will subject abusers to warrantless arrests. The concern is that in societies where domestic violence is traditionally regarded as a private family matter, without treating domestic violence as a separate crime, the criminal justice system often fails to prosecute domestic violence as vigorously as crimes committed by strangers. In China, however, such concerns appear to have been outweighed by fears among lawmakers and some well-regarded legal scholars that strong legal interventions such as criminalization may promote dissolution of marriages and upset family harmony. Even when crimes are committed during incidents of domestic violence, police arrests face many other legal hurdles when the perpetrator is a family member. For example, prosecution of the lesser charges under “criminal abuse by family members” and “intentional infliction of harm” under China’s Criminal Law requires proof of “minor” or “light” injury. Under Chinese forensic standards, such injuries are substantial and include physical injuries such as diminished hearing or eyesight, multiple broken ribs, and miscarriage as result of external impact. Police typically are unwilling to make arrests unless proof of such injuries is obtained from medical examiners. Even in misdemeanor domestic assault cases where a perpetrator can be briefly detained by police without proof of injury, police are reluctant because such detentions can only be made upon request by victims, who are known to change their minds after the initial requests. It should come as no surprise that many predict the less onerous civil enforcement option of written police warnings will likely become the default police domestic violence response in lieu of making arrests. Caught in the middle are victims of long-term domestic abuse who live in fear of recurring violence but, unless and until there is evidence of significant physical injuries, cannot expect the full protection of the law and have their abusers removed as a security threat. From a broader policy prospective, China’s legal approach to domestic violence suffers from its ambivalence about making individual victim safety a top priority. By elevating family harmony and social stability on par with victim safety protection, the DV Law struggles to achieve multiple competing and potentially conflicting policy objectives. At its core, “family harmony” reflects Chinese society’s deeply rooted values which place a premium on the moral obligation of victims (especially women) to sacrifice personal security for family unity. Historically, China relied exclusively on informal mediation by family members, community organizations, and employers to resolve domestic violence as family disputes amenable to conciliation. In neighboring Taiwan, which shares similar cultural values, family harmony was embraced in its first domestic violence law in 1998 as a key policy objective. However, it was abandoned in subsequent legislative amendment due to concerns of its detrimental effect on victim safety by perpetuating society’s tolerance of violence against women in the name of harmony. In China, family harmony also resonates with the state’s paramount political priority in maintaining social stability. During the past decade, rising social tension as a result of rapid economic growth, income inequality, and abuse of official power has heightened the government’s stability concerns. Increasingly, using mediation to resolve interpersonal disputes has become an integral part of China’s stability strategy to contain social conflicts. The same strategy also applies to the state’s handling of family disputes where domestic violence is present. Police are required by law to mediate in misdemeanor assault cases involving family members. Courts are known to be under pressure to overlook and downplay spousal abuse in their push to mediate divorce and other family disputes involving domestic violence. The convergence of China’s interests in social stability and family harmony in using mediation to promote conflict resolution and conciliation of family discords can compromise victim safety. In many countries around the world, the use of mediation in domestic violence cases is disfavored due to concerns over the power disparity between victims and their abusers and the potential for coercion as a result of fear and intimidation of victims in abusive relationships. In China, critics have blamed the pervasiveness of mediation for society’s failure to assign blame and punish abusers. At a minimum, the pressure to mediate has contributed to the infrequent use of criminal justice response against abusers who pose a safety threat to victims of domestic violence. Despite its various legal and policy constraints, the political momentum generated by China’s new DV Law has opened the door for advocates and key government stakeholders to develop implementation mechanisms which can be designed to address specific victim safety concerns within the current framework. For example, several local pilot projects are underway in Hunan which involve the official Women’s Federation working with police and the courts to establish multi-agency domestic violence response systems focusing on coordinated crisis intervention in high risk cases. One important feature of such systems is the close collaboration between police and victim support services by training police officers to screen for victims who are in danger of death and serious injuries, and connect them to domestic violence hotlines for immediate safety planning. Similar screenings in the U.S. have resulted in a significant increase of high risk victims receiving support services. This approach has the advantage of sidestepping the thornier issue of police arrests under Chinese criminal law while targeting law enforcement and support service resources to protect the most vulnerable victims. Innovative solutions focusing on coordinated state intervention in high risk cases can improve the effectiveness of China’s domestic violence response to better protect victim safety. Ultimately, the success of any domestic violence law reform, notwithstanding its deficiencies, will be judged by whether victims can be kept out of harm’s way.